Head over to this gem on the North Shore for a fun Spring afternoon. It’s an easy 2km trek round trip that takes about an hour and a half to complete. It’s sitting along the rugged coastline along the shores of Howe Sound and you can enjoy some stunning views of the mountains. Besides hiking trails, there’s lots of rocks to climb on and a beach to relax on. Lots of scuba divers also head to this spot! This spot has a network of easy trails to take on, with up to 6kms. They’re relatively flat and take only a couple hours to complete. The park is open year-round, but Spring just may be the best time to go. Because of the stunning lighthouse and the coastline—you’re going to want to bring some snacks and have a little picnic as you soak up the views. A short little trail walk that takes about an hour and a half, with just over 5kms to explore. It’s in the popular Lynn Headwaters Regional Park, which has many different trails to choose from. The loop is a short trail which takes you through the lush forest and then goes back along the rushing waters of Lynn Creek. A good spot for forest bathing as you’ll feel completely immersed in the wilderness. It has about 10kms of trails which could take up to 3-hours depending which route you go. You can find this serene spot on the west side of Vancouver. It has lots of lush trees and more than 750 hectares of forest. It’s a great spot to bring your friends, especially four-legged for a relaxing stroll. One of the most popular easier trails in North Vancouver, this spot is a must. It’s just over 3.5kms and takes about an hour and a half, with an elevation gain of 100-meters. Nestled in the quaint community of Deep Cove, it’s the perfect place to welcome Spring. Hit the trail and enjoy the views from the top of the rock before rewarding yourself with a sweet treat from Honey Doughnuts afterwards (you’ve earned it). Visit this spot on the North Shore for a 3km route that takes about an hour and a half. It has an elevation gain of 130 meters and offers plenty of stunning scenery. The short walk takes you through a forest full of old Cedar and Douglas Fir trees. You then follow along Cypress Creek until you reach two beautiful waterfalls. Another North Shore favourite. A one hour hike that takes you through 1.5kms of trails. It’s a really short but memorable hike that crosses over the gorgeous Lynn Canyon Suspension Bridge and follows Lynn Creek down the river before crossing over another wooden bridge. It then loops back to the other side of the canyon. and looping back on the opposite side of the canyon for even more photo-opportunities. This easy hike on the North Shore takes about 2-hours to complete and it offers some amazing views of downtown Vancouver and beyond. It has about 5kms of trails to explore round trip. You’re going to want to spend some time once you reach the top and it’s quite a stunning sight to see. 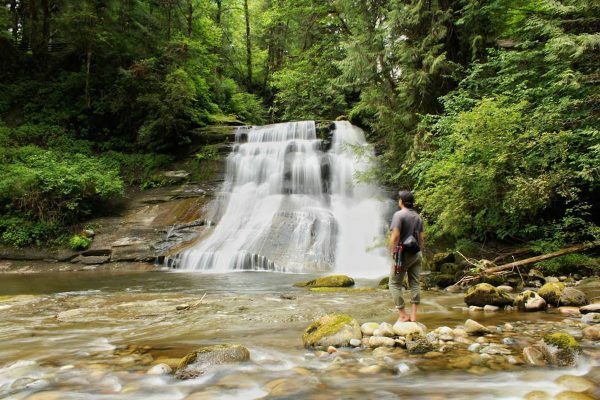 Add this spot in West Vancouver to your Spring hiking bucket list. It offers 5kms of easy trails that take about 2-hours to complete. You follow Nelson Creek, going uphill through a grove of Douglas Fir and Western Cedar trees before reaching the small but scenic lake.